A plaque on the Manchester Town Hall records George VI's titles before giving up "Emperor of India". 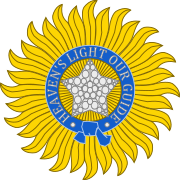 नाम के बाद 'R' और 'I' लैटिन भाषा में राजा और सम्राट दर्शाता है। ('Rex' and 'Imperator'). ↑ "Aśoka – Britannica Online Encyclopedia". Online encyclopædia. Encyclopædia Britannica. अभिगमन तिथि 2008-07-08.